(Inside Science) -- On October 8th, Elon Musk, CEO of Tesla Motors and Chairman of Solar City announced the Solar Roof -- an ambitious new kind of solar panel that looks like an ordinary roof tile. That aesthetic design innovation could make a big difference in the rate of adoption of solar power. But, on the technical side, scientists and engineers are also working to make solar cells better, greener, and more affordable. 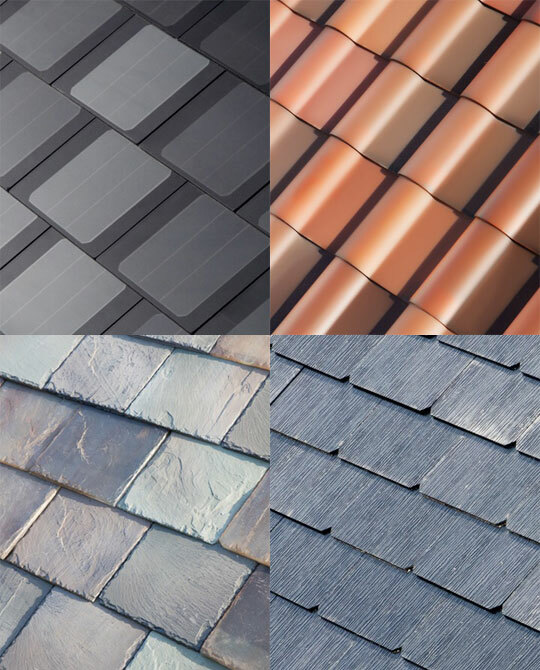 Tesla Motor's Solar Roof,which has four different aesthetic styles. Courtesy of Tesla Motors, Inc.
Because they reduce the need to burn fuels, renewables, like solar panels and wind turbines, are essential to any effort to reduce climate change induced by carbon emissions. Even though their impact on the environment is relatively minor, renewables aren't completely without their woes, however. For instance, there are controversies concerning wind turbines and their impact on local bird populations. Solar power has also raised some other environmental concerns, most notably due to the harmful chemicals used during the manufacturing process. Since renewable energy directly competes with the existing energy infrastructure, it is considered a disruptive technology, meaning it threatens the economic landscape for those who are invested in generating power from fossil fuels, including corporations who manufacture and profit from them, politicians who support them and the public in whose lives they are entrenched. As is often the case for a disruptive technology, there has been plenty of resistance against the transition to renewables from fossil fuels. But as the public slowly begins to accept the idea of human-induced climate change, the tide is now turning. If and when renewables become more affordable than fossil fuels, the economic incentives will encourage consumers and energy companies to transition from fossil fuels to renewables as the source for our electricity. Today, roughly 90 percent of all solar panels sold in the U.S. use conventional silicon based cells to transform the sun's energy into electricity. It's a very mature technology and further improvement is relatively difficult. In fact, the efficiency for silicon solar cells has remained more or less the same for the last 20 years. According to Joe Berry, a scientist at the National Renewable Energy Laboratory in Golden, Colorado, the efficiency of "silicon solar cells is already within spitting distance to its theoretical maximum efficiency." Today's efficiency record for silicon solar cells in a laboratory is roughly 26 percent, with a theoretical limit around 32 percent. But the technology overall is far from stagnant, due to the steadily increasing investment in solar energy, including the ongoing SunShot Initiative. Scientists have discovered many new alternative options. In many laboratories, researchers have already surpassed the 32 percent limit for the silicon solar cells. In fact, solar power has already become cheaper than fossil fuels in certain areas. However, the high upfront cost remains a major obstacle for the average consumer -- people generally don't have the money to buy 20 years' worth of fuel in one go, which is essentially what installing a solar panel represents. While larger and more efficient factories continue to make silicon solar panels cheaper, scientists and engineers are also tapping into newer technologies to further lower the manufacturing costs. This has resulted in Swanson's law, in which the price per watt for solar energy has been and will likely continue to drop exponentially. Similar to how Moore's law has predicted the exponential growth of computer technology in the 20th century, solar cell technology will continue to advance as newer technologies are discovered and implemented. 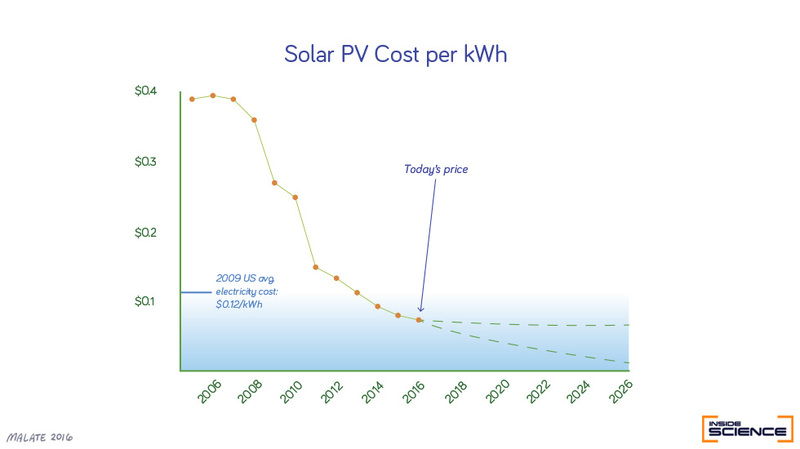 The price of solar energy for the past 10 years, the dotted lines show the approximate range for future projection. (Data taken from here and here). In the past, electronics used vacuum tubes instead of computer chips as transistors. In the future, silicon solar cells will likely be replaced by something newer and better in a similar fashion. Two of the most promising solar technologies on the horizon are perovskite solar cells and organic solar cells. Perovskite solar cells are named after the structure of the material used to make them. Cells made with these materials have seen a dramatic efficiency improvement over the past few years. Combine that with a potentially much cheaper manufacturing process, and perovskites are becoming very attractive to the commercial market very quickly. "However, there are environmental and economical issues that we need to overcome before perovskite solar cells can be ready for the market," said Dong Hoe Kim, a researcher at the National Renewable Energy Laboratory in Golden, Colorado. He was part of the collaborative effort with a Korean group that published a paper on perovskite solar cells this spring in the journal Nature Communications. Despite the potential advantages of perovskite solar cells, their relatively shorter lifespan is a significant hindrance, although researchers are working to extend that as well. There is, however, a way to get around the problem -- effective recycling. “FTO (fluorine doped tin oxide) glass and gold are the most expensive components of a perovskite solar cell," said Fengqi You, a solar cell expert from Cornell University in Ithaca, New York. "Recycling and reusing these materials will make the perovskite solar cells much cheaper and greener." As you might have guessed, this is easier said than done. Imagine the solar cell as a beer bottle with a glued on label. The bottle is made of expensive FTO glass and the label is made of gold. In order to effectively recycle both the bottle and label, you would need to separate the two first -- and remove the glue. The "glue" in this case would be the perovskite materials that attach the gold electrodes to the FTO glass. It is very stubborn, but you can't just use a different glue because the material was chosen for its ability to convert sunlight into electricity, not for its gluing ability. So, how do you peel the golden label off of the expensive bottle? After experimenting with many different kinds of solvents, Kim and his group found the perfect solution to dissolve the perovskite without harming the bottle or the label, like what Goo Gone does to stubborn labels. The solution, or solutions, each optimized for a specific kind of perovskite, can melt away the photovoltaic layer without damaging the gold electrodes nor the expensive FTO glass, all in one fell swoop -- much easier than peeling off a stubborn label. You can see it in action in the video below. Because this method makes it easier to effectively reuse the most expensive components of the solar cell, this method can further lower the manufacturing cost of perovskite solar cells when they hit the market in the future. As promising as perovskite solar cells seem, the devil is always in the details, and the politics -- they almost all contain lead. "Lead free perovskite is a very hot topic right now, because if we can remove all the toxic lead from pervoskite solar cells, we can make them more appealing for the market," said Dewei Zhao, a physicist from a research group at the University of Toledo that recently published a research paper in Advanced Materials. After trying to substitute lead with other chemically similar elements, such as germanium, antimony, and bismuth, Zhao and his group discovered that tin appears to be the most promising replacement. The 6.2 percent efficiency that they reached is still a far cry from the 22 plus percent boasted by their lead counterparts. However, as is often the case in science, their discovery has opened up a whole new avenue of research. By substituting for some of the lead with tin, researchers expanded the range of wavelengths of light that the perovskite solar cells can convert to electricity. That is, they can use a greater portion of the different wavelengths of light produced by the sun, enabling them to create something known as multi-junction solar cells. "They showed that by alloying tin with lead it allows you to make multi-junction systems," said Berry. This is important because a multi-junction system can "get more energy out of the solar spectrum that you would have otherwise gotten with just a single junction." If the perovskites were little creatures that eat Skittles for energy, a multi-junction system diversifies the kind of Skittles the little creatures can eat. Now instead of just having little creatures who only eat red Skittles, now we also have ones who eat blue Skittles. 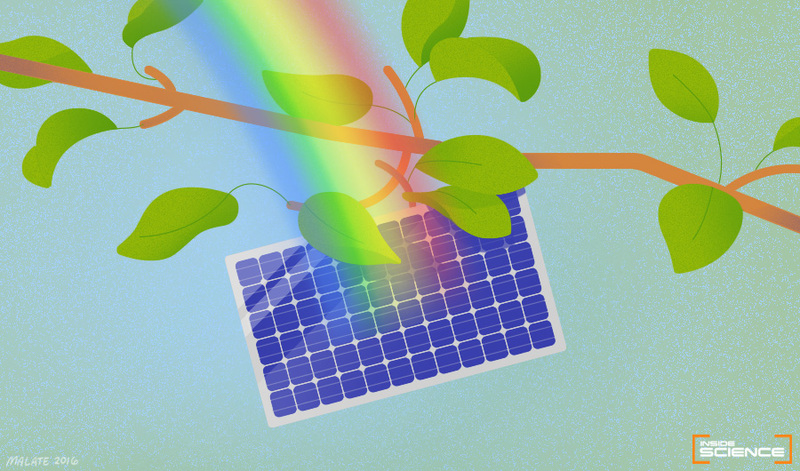 By tasting more of the rainbow, quite literally, the multi-junction perovskite solar cells can produce more electricity. The new tin-lead alloy solar cells kill two birds with one stone by improving the efficiency and reducing lead at the same time. It is also important to keep in mind that the amount of lead in these solar cells is very low to start with. In fact, there is less lead in a perovskite cell than "the amount of lead in a silicon solar cell in its soldered joints," according to Berry. Another first-round draft pick for next-generation solar cells are organic solar cells. Going organic here doesn't mean that the solar cells can be grown like heirloom tomatoes, but rather that the materials are mostly made of carbon-based materials. The main components of an organic solar cell are made of polymers and fullerenes, which are materials structurally similar to plastic bags and pencil lead. When exposed to light, the polymer nanoparticles within organic solar cells donate electrons to the fullerene nanoparticles. The electrons are then funneled out to the power grid. "In these mixtures of nanoparticles, there are clumps of nanoparticles which form islands, isolated from the electrodes," said Venkat Padmanabhan, a physicist from an Indian research group that published results in September in the journal Scientific Reports. He is now a professor at Tennessee Tech in Cookeville. "If an electron-hole pair is created, but the electron got trapped in one of those clumps, it just lingers around in the clump until it recombines with a hole, and the power is lost." An electron-hole pair is exactly what it sounds like -- as a polymer nanoparticle gives a negatively charged electron to the fullerene, it also leaves a positively charged hole behind. If the electron taken by the fullerene is not siphoned out into the grid in time, it will eventually recombine with the hole, and thus lose its charge. In order to find a way to help move the stranded electrons to the electrodes, which are essentially "exit point" for the electrons into the power grid, Padmanabhan and his colleagues used computer simulations to explore various possible solutions. Eventually, they did this by building a microscopic network inside the organic solar cell using silicon, the same kind of material found in glass and sand. "Essentially they showed the ability to use microscopic scaffolding to increase the way in which the molecules line up," explained Berry. The computer model eliminated the need to test sample after sample with slightly different versions of microscopic scaffolding, which allowed the Indian group to speed up the investigation process. "The next step is to make these systems in a laboratory and check the efficiency to see if we can go over the current record [for organic solar cells] which is around 10 or 11 percent," said Padmanabhan. "We are predicting that it can go into the 20 percent range." Solar power has seen unprecedented growth in the past few years. If the current trend holds, the price of solar generated power is projected to be cheaper than fossil fuels by 2020. But just like newer technologies have kept up Moore's law for computers, the same is true for Swanson's law in solar. That's why silicon-based solar cells may soon be outshined by panels using other methods to harness the sun's energy. In terms of efficiency, there are already laboratory samples of multi-junction solar cells in the 40 percent efficiency range, far exceeding 32 percent theoretical maximum for the efficiency of silicon solar cells. With a theoretical limit of over 80 percent, we can expect these next generation solar cells to soon soar pass the glass ceiling of silicon solar cells. In terms of cost, both the perovskite and organic solar cells can be liquidly processed, meaning that you can literally print them out on a piece of paper, and do it cheaply -- much cheaper than the current silicon based solar cells. This also means that these newer solar cells are also flexible, so think less like mirrors on the wall like your traditional solar panel, but more like curtains you can hang, or even clothes that you can wear, and drastically cut down the installation cost. Thin film solar cells, an older technology for flexible solar panels. "We can think about ways to printing them out like the New York Times or the Washington Post, or spraying them on the side of a house, or integrating them directly into other things," said Berry. Imagine a car with no gas tank but just a thin layer of photovoltaic paint, or perhaps applying the paint as a tint to the windows, to the wall, or on the rooftop -- these are no longer unattainable sci-fi fantasy, Tesla's solar roof may be just the beginning of a process that will make the technology cheaper, better, and more accessible to the public. Yuen Yiu covers the Physics beat for Inside Science. He's a Ph.D. physicist and fluent in Cantonese and Mandarin. Follow Yuen on Twitter: @fromyiutoyou. Is Seaweed America's Next Cash Crop?